Curricula and demonstration materials to educate classes and groups. The Dads: The Basics Guidebook is a comprehensive handbook on fatherhood. It discusses the infant's basic needs, coping techniques for crying and an overview of SBS/AHT. This high-quality, 5-minute CD is an excellent tool for use in all SBS training sessions. 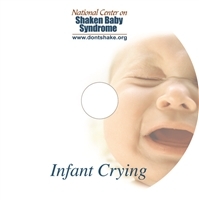 The full 5 minutes consists of an infant during a pain-like crying period. These 20”- 22’’ dolls are a powerful way to illustrate what can happen when an infant or young child is shaken. The dolls are the approximate dimensions of a 2-3 month old baby. The dolls are not anatomically correct or have mechanical components such as lights. Select between Caucasian, African-American, Asian and Hispanic dolls. The School-Based Program is designed for Secondary Education students. This field tested program educates students on the medical characteristics of SBS and the long term consequences for the victim and the perpetrator. It reaches young adults as potential caregivers and future parents by teaching students how frustration can lead to shaking and helps them understand the importance of appropriate coping skills. The moving documentary "Elijah's Story" accompanies the program along with an updated letter from Elijah's mother, Emily. The program includes several demonstration materials and ideas, a presenter's manual with a quiz, and talking points for the documentary. Click here for the history of the School Based Program. This CD-ROM features over 100 educational slides with 24 unique animated slides including excellent visual and oral descriptions of SBS/AHT. This state-of-the-art CD-ROM takes you through the causes, symptoms, injuries and outcomes of SBS. This PowerPoint presentation can be downloaded with or without narriations. The full color computer animations shows the movement of the brain, eyes, bones, and neck when a child is shaken. This overview is great for lectures and court proceedings.